... 1881 (130 years ago today), workers from an array of occupations met at Turner Hall in downtown Pittsburgh, Pennsylvania, to found the Federation of Organized Trades and Labor Unions of the United States and Canada. 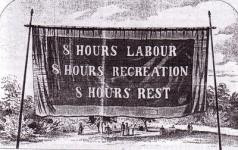 Among the group's earliest actions, it "called in 1882 for the celebration of Labor Day on the first Monday in September, and also called for work stoppages and demonstrations on May 1, 1886 in favor of the eight-hour workday (initiating May Day)." (image credit) In 1886, it was renamed the American Federation of Labor -- an organization extant today in the form of the AFL-CIO.